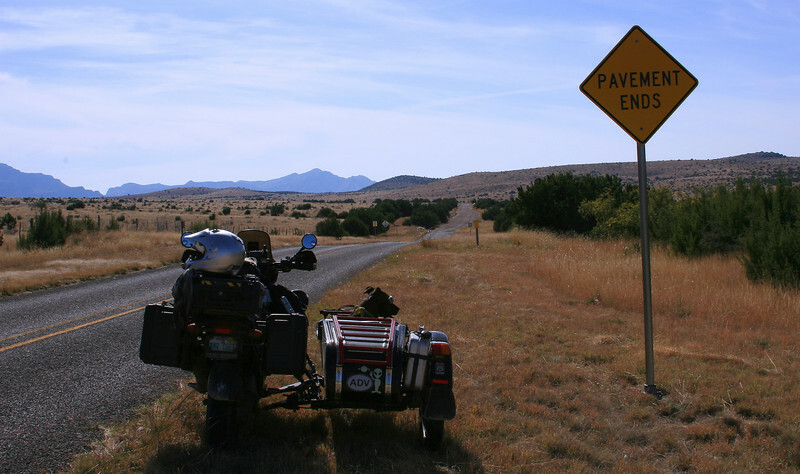 As we rode yesterday the 260 miles or so "Pinto Canyon loop" as I call it, all I could think was "so much land… so much land… why is everyone piled up on each other in this world?". Of course I know the answer… mainly the mighty "dollar" income needed to survive… I cannot help always thinking that there is a better way to live for us, but I know that the answer to that one is not to be found for all in my own lifetime. Since attending all the local events these past weeks, not much riding by us had been done and we (?) were eager to get on the road early morning. My watch has been broken since we have arrived here, I yet have to take the steps to buy a new one or fix it, so we depend on the sun to give us a general idea where we stand throughout the day, specially when going for a ride. I do follow directives from other fellow riders… the consensus was to ride Pinto Canyon southbound, the reason? "downhill". At the same time, picture taking is always for me a daily project and fun pleasure. I knew that leaving Terlingua early morning, through Alpine and Marfa, would put us on the trail by the afternoon, the worse time to take pictures! I am pretty much a newbie at photography, I do get to use the camera just about everyday, through a lot of reading and a lot of questions it has been a learning curve. I do not have Photoshop and some thoughts came up yesterday as the bright sun was not… making the pictures look "nice"! My favorite times to shoot with the camera are early mornings and right before sunset, the window of opportunity is fairly short. Another factor is the sun, riding southbound yesterday the sun was right in front of us, I had to look backward for some good shots. But what happens if I want to show what was ahead of us… a white sky… much glare… and I thought, let it be… Some pictures might be pleasing to the eyes with a coincidence about depicting the ride, and some will just show… actually will need to show exactly what the vision is while riding, in other words, some pictures need to be the reality of the moment, pleasing or not… I sure hope all this makes sense! Alpine was our first stop, yes, you guessed it, the Bakery. Some take out for a future snack and also to check out a new Gallery put together by 8 different Artists, Gallery which will be open late at night the 16th and 17th, dates for the Alpine Art Show coming up. Of course we will be there! Food, Art, Music… We arrived in Marfa at high noon, seems that my food route was planned perfectly as the Pizza Connection was open and we arrived only a few seconds before the big rush. This is the area’s best food in my book… on the same level with Kathy’s BBQ pink shack, of a different menu. And by the way, in case I had forgotten to mention it before, I am no longer working 3 nights a week at "LaKiva". Let’s say, personal reason on certain aspects of the kitchen… I skipped the Pizza yesterday, I try to avoid carbs at all cost when riding, but… the chicken salad sandwich did come with two slices of crispy baked Pizza dough, I could not resist! It was delicious. So we are now both happy, Spirit rested in the shade (he already had breakfast back at camp! ), his water is in front of him, we use now a big 5 gallon collapsible bucket for his water to be there at all time as I am always afraid he is not going to drink enough. With high walls the bucket keeps the water in even on rough road and being soft there is not danger to harm him either. I knew there would be eventually a reason why I had two of those when we left for this Journey! Going eastbound on 90, 2810 is the road to take southbound to get to Pinto Canyon. 32 miles of paved road was the first stretch. 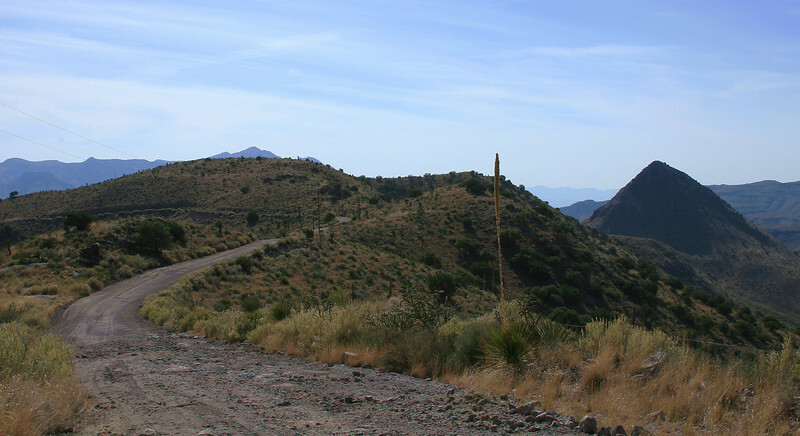 I will say it right now, from the time we left Marfa’s paved road and Pinto Canyon’s 22 miles of dirt road to Ruisada on River Road, to Presidio, another 37 miles, we only encountered one Border Patrol napping in the bushes and a Ranch truck with trailer coming the other way. That is it. Having a vehicle in good running condition, with 178,000 miles ours is barely breaking in, food, tools, blanket, much water, First Aid kit, all is of a must. A Sat phone of course would be a great addition if one can afford it. Beautiful vast and calm scenery, and soon the sign came up for the pavement to end. This is what it looked like from space at this point. Elevation is about 5100 feet and mostly we were going downhill from here. And we did. The road’s difficulty? A bit rough at first and steep, no sand but big rocks… No for a street bike, but also no great expertise needed, of course we are more stable than on two wheels. The views?… well, spectacular! Nice carved roads, great temps throughout the ride, and again I have to say that Spirit does not cease to amaze me, besides that fact that he can write now! I don’t think many Dogs would keep a composure as he does! We bounce around a lot, we slide right and left, maneuvering the rig is a bit tricky when the road is not leveled, and through all this he is not just a passenger, but "part" of it… I feel his excitement, he sits up taller than usual, he is up forward more and constantly checking me out, the road, right, left, back to me… He does not have to talk… I feel his joy!!! He quite often overwhelms me! He does not like water, but if he did I bet he would be one of those dogs that surfs! The road was laid out ahead of us, its vision like a ribbon dictating it’s path, I was content that it’s degree of difficulty was not worse, turning around sometimes is a not welcomed task on a road too narrow, without reverse, even with the come-along, strap and anchor that I carry. The rest of the story next time. 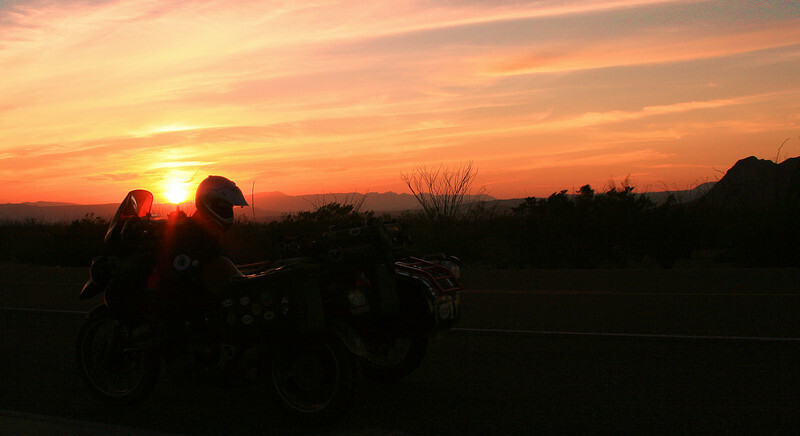 We actually need to do this again… and maybe again… Maybe later on the day to witness a sunset, which we did yesterday past Presisidio, riding back in the dark is not a problem, as you will see next time the road turns into a freeway sort of after a few miles! 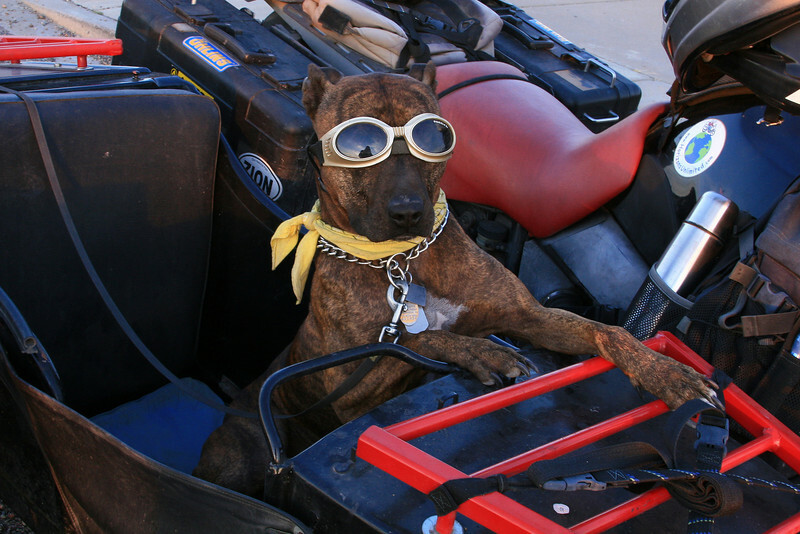 This entry was posted on Friday, November 9th, 2007 at 10:16 am	and is filed under travel, spirituality, pit bull, sidecar, motorcycle, cooking, photography, riding, homeless. You can follow any responses to this entry through the RSS 2.0 feed. You can leave a response, or trackback from your own site. Ara do you get to see a lot of wild life on your rides? From the pictures you are so out in the middle of nowhere I’d think you’d see all kinds of stuff. Do you tell people your route in case you break down somewhere? Hi Ara and Spirit, thought I’d leave a comment on your blog. I visit it from time to time and want to say thanks for taking the time to share the adventures the two of you have. You are in the part of Texas that I love and if you stay long enough, just might bump into you again out there. 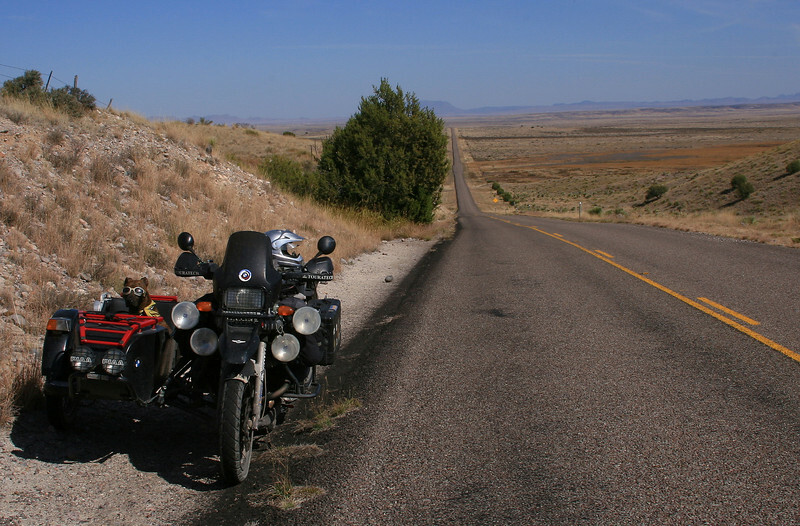 The Pinto Canyon/ Marfa loop is a good one, I have done it myself and have some of the same pics. You guys be careful out there and enjoy. 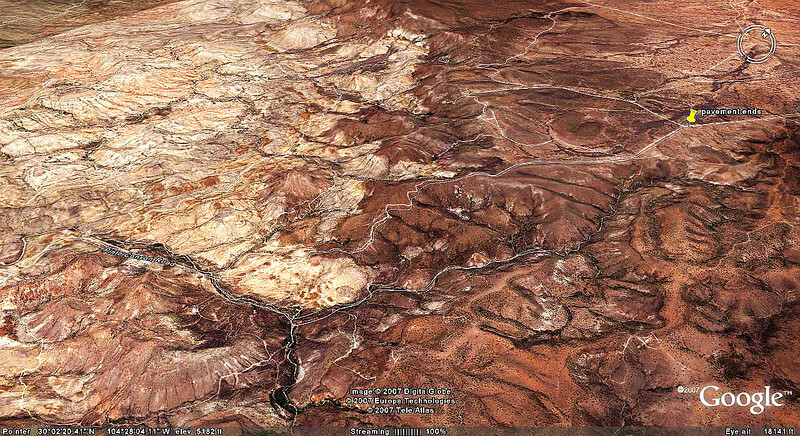 Very cool blog, we’ve made the Pinto Canyon loop once. We had a couple of experiences there that can only be characterized as surreal. 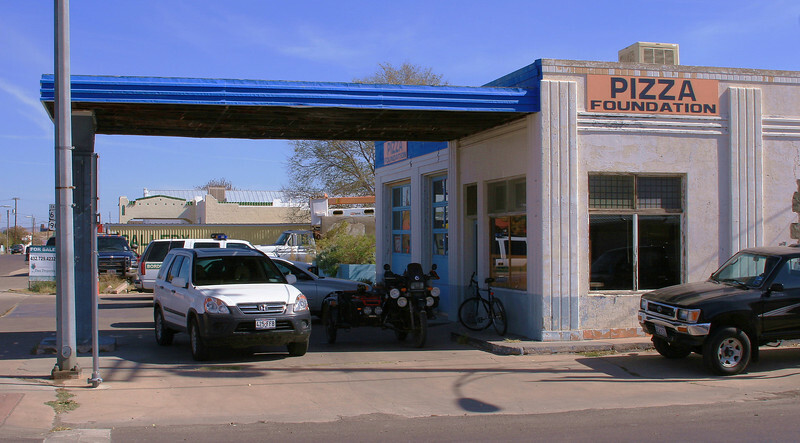 First, we were driving through Pinto Canyon listening to the BBC on the Marfa NPR station, which my wife and I found a bit incongruous. We arrived in Riudosa in need of cold drink, but the store was closed. Fortunately we met the owner of the local cantina and several visitors in the parking lot. Consistent with our experioence of Texas hospitality he invited all of us to the cantina for beverages and conversation. During the course of conversation we discovered that among the vistors was a stringer for the NY Times, on assignment to report on the restortion of the Riudosa chapel! The probability of which we thought low. We’re in western New York, living vicariously through your blog, and hoping to visit next month. 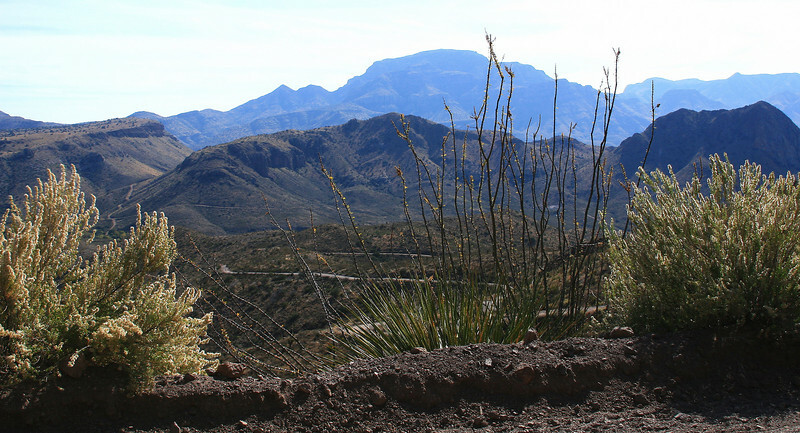 I’m a landscape artist here in Big Bend country and I enjoy seeing my favorite terrain thru your eyes. 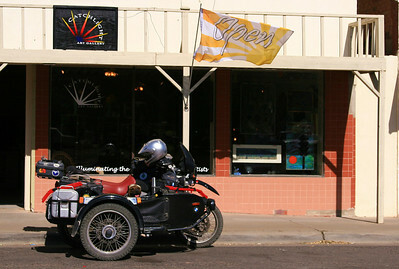 (We actually met last year at Kiowa Gallery during Alpine’s Gallery Night. My sis was there, and you two visited about common grounds in Europe, maybe a castle in Belgium–I got lost!) We’re about to venture to the Pinto Canyon area to research and photograph something magnificent for me to paint as the featured painting for this year’s Gallery Night at Kiowa. Friends Nelda and Jerry linked me to your site. Thanks for the pre-tour info. I feel like we hired a tour guide to direct us. And buy that dog some more bones on us! 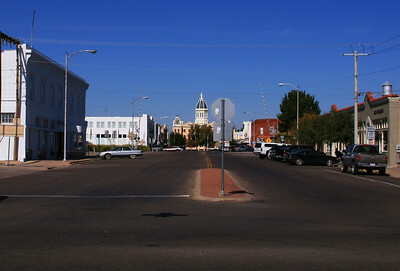 My blog, btw, is Wandering of An Artist in Far West Texas. blog.lindycseverns.com Check it out –we travel many of the same roads!